Giannis and the Bucks had the talent to compete in the Eastern Conference. Now in Mike Budenholzer they have a coach who can keep up with their trajectory. The Bucks have been a team on the rise for years, but a number of setbacks have slowed their progress. Jason Kidd's leadership, Malcom Brogdon's injuries and other issues have all hurt them in years past. 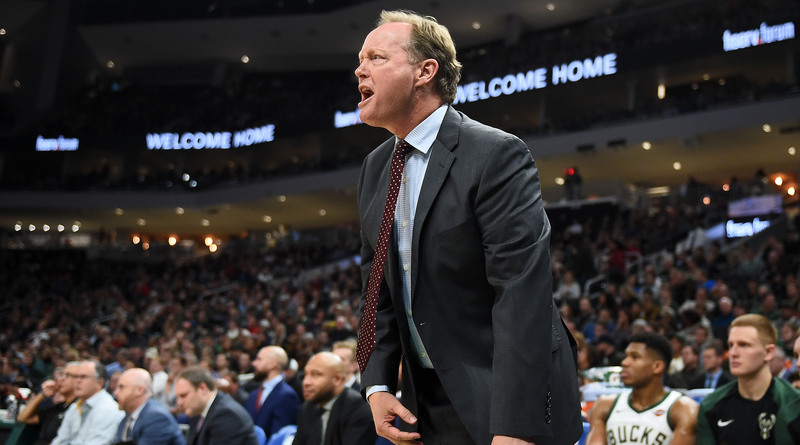 But now, with Mike Budenholzer in the fold, Milwaukee could finally be on the right path. Ben Golliver and Andrew Sharp of the Open Floor podcast discuss the Bucks' future. Andrew Sharp: Coach Mike Budenholzer was already great at overachieving with a bunch of above-average players who weren't necessarily real superstars. There's that one year where I think five Hawks made the All-Star Game, which was an accomplishment, but also was a damning blight on the Eastern Conference and the state of the basketball there over the last 10 years. Ben Golliver: What you're saying is when Bud is equipped with a Giannis instead of Jeff Teague as his lead ballhandler... surprise, surprise, things look amazing. Sharp: That's exactly what I'm saying. Giving coach Bud an honest to God MVP candidate takes all of this to a totally different place, and honestly I don't even know how crazy this can get in Milwaukee because there's a real possibility they can go win 60 games this year. Sharp: They're just really, really good night to night, and if you're asking me about Khris Middleton and Giannis, I don't know if I'm ready to put them above Chris Paul and James Harden after two weeks but check back in six weeks and it's not impossible. Giannis is that good and Middleton is a perfect complement to him. Golliver: Nothing makes me happier than when you stan out for the Bucks harder than I do, because that's not easy to do and then we get into this competitive thing and see who can say the more reckless thing. Do I have to come back now and say they're going to win 65? I was over here ready to say they're definitely going to win 50. We've been saying for three years they're going to break through, they're finally going to get 50 this year and then you come out of left field with 60. I guess going a bit ahead, homecourt team in the East this year? You think they can hold on for that? Sharp: I just predicted they'd win 60 games, they're definitely going to have homecourt. Golliver: Well, you said it was possible. You were hedging a little bit, but I think for sure they're going to be a top-4 seed. I don't see any way that goes sideways, and so at that point they should win their first-round series and then things could get really, really interesting. I always book out my hotels for the Finals a month in advance. So I've already hotels in Philly, Toronto, Boston. Would it be absolutely crazy for me to book some hotels for Milwaukee in June? Would that be nuts, Andrew? It wouldn't be crazy, would it? Sharp: I was wondering whether you were going to go there, because for people listening, during almost every Bucks game this year, Ben has texting me saying they are going to the Finals. For me that's crazy. I think they have a chance to be an awesome regular season team that is still a level below Toronto and Boston once you get to May. Golliver: They're better than Philly, though. If you had to say who would make the Finals, Philly or Milwaukee, who would you pick? Sharp: I would definitely pick Milwaukee. It's not strictly coach Bud being an MVP-level coach. I think he's a really good coach, I think he's clearly a top-10 coach. You could make an argument he's a top-5 coach. And Jason Kidd was really that bad, and a lot of his systems on both ends didn't make much sense. But I also think we have to remember how much it helps to have a healthy Malcolm Brogdon there this season, and you have Ersan Ilyasova and Brook Lopez kind of helping fill out the rotation. Really, when you've got players as good as Giannis and Middleton, to a lesser extent, at the top of the roster, adding one or two solid players to fill things out can go a long way, and I think some of that is what's happening in Milwaukee as well. The team is more solid across the board than it was a year ago, and then at the same time they're taking much smarter shots and everything makes a lot more sense than it has for several years in Milwaukee.